Defrost spinach. Peel and finely chop garlic. Add dumpling bread, spinach, eggs, milk, and chopped garlic to a bowl and mix until combined. Season with nutmeg, salt, and pepper. Grease cooking container with butter. Moisten your hands and form equal-sized round dumplings out of dough. Transfer to cooking container. Steam at 100°C/210°F for approx. 12 min. Cut radicchio, halve grapes, and roughly chop parsley. Add to a bowl with sunflower seeds and mix well. Add yogurt and lemon zest to a small bowl and stir to combine. Season with salt and pepper. Melt butter in a small frying pan on medium heat. Reduce heat and fry butter for approx. 8 min., or until browned. Serve salad on a plate and drizzle yogurt dressing on top. 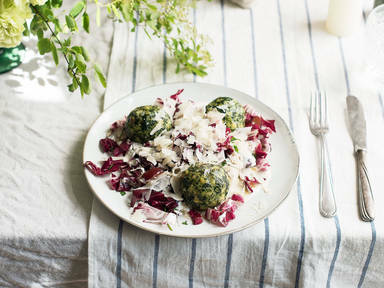 Add spinach dumplings, drizzle with brown butter, and enjoy with freshly grated Parmesan!